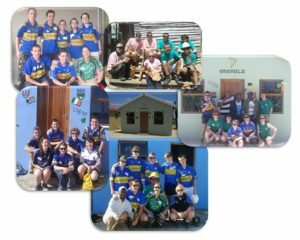 Cashel Community School first participated in the “Niall Mellon Blitz” in 2007.
sense of pride they and we feel in their endeavors to date. The link below will direct you to a Blog written by one of this years volunteers (Aoife Bourke) on her experiences in Africa. To view photographs of our volunteers in South Africa please visit the Galleries section of this website. Voluntary work in the local community has been and remains an integral part of theTransition Year programme in Cashel Community School. There are six centres involved: St. Patrick’s Hospital, The Nagle Centre, King’s Deli, Scoil Aonghusa, St. John the Baptist Girl’s Primary School and Cashel Day Care Centre. Transition Year students visit three of these centres during the year and spend time with the patients/students/service users/senior citizens in their chosen centre. this experience gives the students a unique insight into the world of others in their local community. The students get an opportunity to contribute to the lives of other people within their community which is beneficial to all involved. Their involvement fosters patience, compassion, understanding and respect. We are very grateful to the various centres for their continued support of and interest in the Transition Year Programme offered by the school. Every May, students in Cashel Community School take part in the Irish Guidedogs for the Blind ‘Shades’ campaign to raise money for this very worthy cause. By selling Shades pins within the school, the students raise much needed funds for the training of these wonderful animals. This annual event in CCS encourages teachers and students to become more aware of breast cancer and raises funds for this worthy charity. Teachers dress in pink, goodies with a ‘pink twist’ are sold and much fun is had through the activities held! Each year the school sponsors two Fifth Year students to help care for the invalids on the diocesan pilgrimage to Lourdes. Holocaust Education Trust Ireland provides schools with yellow crocus bulbs to plant in autumn in memory of the one and a half million Jewish children and thousands of other children who died in the Holocaust. The yellow flowers recall the yellow Stars of David all Jews were forced to wear under Nazi rule. The activity presents an opportunity to introduce students to the subject of the Holocaust. It is a tangible way to stimulate discussion and create awareness about discrimination. In Ireland, the crocus blooms at the end of January – around the time of international Holocaust Memorial Day (27 January). When people admire the flowers, students explain what they represent. The Crocus Project complements existing material on racism and interculturalism. The students involvement in planting the bulbs and watching the flowers grow encourages ongoing learning about the importance of tolerance and respect.The Holocaust Educational Trust of Ireland arranges for Holocaust survivors to visit schools. In 2008 we were honoured to have Tomi Reichentall visit Senior Cycle students in Cashel Community School. Meeting with Holocaust survivors and hearing their personal testimony prompts students to consider the Holocaust and its consequences, reflecting on wider issues of racism and intolerance. After hearing Tomi Reichental speak, students organised with the help of Woodwork teacher Michael Purcell and School Caretaker Michael Hayes to participate in the Crocus Project.